When I started my marketing career many years ago, I learned about marketing funnels that tracked the customer journey from product/brand Awareness to Consideration to Preference to Purchase. That was what we marketers focused on as we planned our integrated marketing campaigns. With the explosive growth marketing technology (martech), maturity of the internet and the billions of connected devices, pretty much everything changed. To complement (and potentially complicate) what was happening on the marketing side there was an equal and opposite sales tech surge – most notably led by Salesforce. With calls for marketing and sales alignment, we not only needed to be philosophically aligned but our technologies needed to work together in order to track goals and outcomes. The analyst firm SiriusDecisions got its start around this time and ultimately unveiled the Demand Waterfall which quickly transformed the way thousands of B2B organizations have approached, managed and tracked lead management over the past decade. With extended purchase cycles and complex decision processes endemic to B2B along with a bazillion marketing touchpoints, the buying journey has become a lot less linear than the good ole days. The good news is that now everything (or nearly everything) is digital, so much can be measured like never before. To go with these major changes, new vocabulary inevitably had to be invented because we don’t have enough already in Silicon Valley. There’s no question that the technology landscape has changed the way we marketers do our jobs. According to Forrester Research, 90% of the buying journey may be completed before a salesperson hears Word One from a prospect. As a result, in today’s digitally driven marketplace, sales reps can be frozen out until very late in the customer’s process. Now more than ever, the onus is on marketing’s shoulders to develop extremely effective programs that attract and nurture leads in measurable fashion through the funnel all the way to the actual revenue event. Nevertheless, many marketers are still only looking at the top of the funnel (or above the funnel), and therefore seeing no more than a small part of the revenue generation process. In everyday life, restricting yourself to tofu can be a risky food choice. 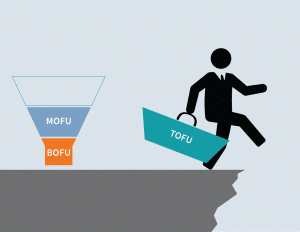 In today’s digital business environment, neglecting to expand your horizons beyond TOFU just might be even more dangerous as you fail to realize both the responsibility and opportunity to guide a prospect through their purchase decision. What’s more, tracking the metrics associated with full funnel marketing (volume, velocity and conversion rates) end up being the key performance indicators (KPIs) to your attribution data. With funnel metrics, you’re able to see what campaigns are helping to progress leads through the funnel and which are not allowing you to re-allocate budget before a complete sales cycle is closed. This is critical for B2B marketers. With all the technology at our fingertips to enhance what we do, there has never been a better time to be a marketer. The sands have shifted and, while more of the revenue responsibility lies at our feet, there is tremendous opportunity to increase impact and lead the business like never before. If you’re not taking advantage of it then your days as a marketer are numbered. For more on Full Funnel Marketing, read our guide called ‘Turbo Charge Your Analytics in Salesforce‘ which provides a helpful starting point for learning the ins and outs of funnel metrics, and will introduce you to best practices around how to use them. Unfortunately, many B2B marketers traditionally have focused exclusively on the top half of the funnel, treating metrics like clicks and retweets and leads as their primary goal.